MIDDLEBURY – In an unusual ceremony attended by friends, family, and collection agencies, Middlebury graduate Amanda Knope was legally married to her student loans after a four year courtship. While criticized by religious leaders as “immoral” and a “slippery slope,” the union was found to be legal after Knope’s loans were consolidated by an anonymous corporation and found to have equal rights under the law just as any other person would. 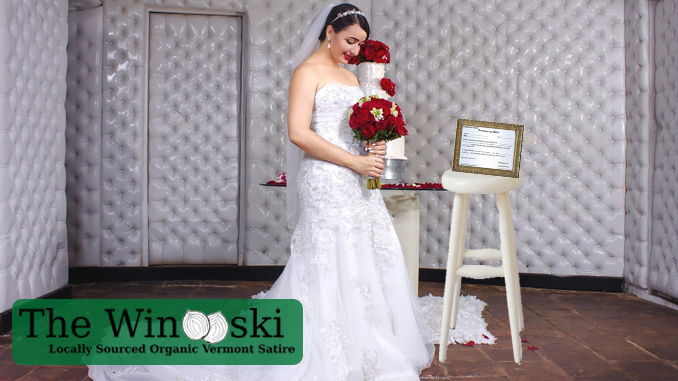 The loans themselves, represented by promissory notes in a golden frame set on an elegant white stool, were said to be very happy with the arrangement, and Knope was beaming as she walked down the aisle. Knope’s wedding party confirmed that her relationship with the loans has been her longest relationship to date, and that the loans are definitely not going anywhere. “It’s pretty much all she talks about,” said one bridesmaid as she rolled her eyes and laughed. The father of the bride, Hal Knope, did express concerns that the loans had shown signs of abusive behavior in the past, but that he was going to keep a close eye on the marriage as it progressed and would step in if necessary to try to separate his daughter from the loans. But most agreed that this would be close to impossible, as Amanda and her loans were legally inseparable.